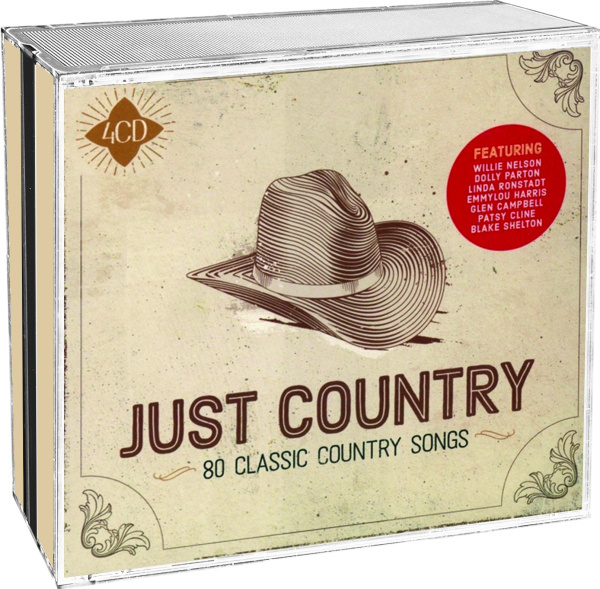 Auf dieser CD-Box präsentieren wir Ihnen sowohl klassische als auch moderne Country-Superstars aus ganz Amerika, wie Kenny Rogers, Lucinda Williams, Dolly Parton und Glen Campbell. 80 Songs auf 4CDs bieten einen Rund-um-Blick über das ganz besondere Genre: Von Eric Weissberg & Steve Mandell’s hillbilly boogie, bis hin zu Seasick Steve’s down home folk, über The Byrds’ crossover Ballen bis hin zu Willie Nelson’s legendären Hits. 1 Parton, Dolly / Ronstadt, Linda / Harris, Emmylou To know him is to love him - 03:50 Min. 2 Rogers, Kenny The gambler - 03:29 Min. 3 Cline, Patsy Crazy - 02:43 Min. 4 Campbell, Glenn Rhinestone cowboy - 03:14 Min. 5 Band, The The night they drove Old Dixie down - 03:29 Min. 6 Williams, Lucinda Sidewalks of the city - 03:44 Min. 7 Parsons, Gram Love hurts - 03:39 Min. 8 Doobie Brothers, The Black water - 04:17 Min. 9 Little Feat Willin' - 02:56 Min. 10 Swindell, Cole Middle of a memory - 03:47 Min. 11 Jesse & Joy Echoes of love - 03:34 Min. 12 Gloriana (Kissed You) Good Night - 03:53 Min. 13 Big & Rich Lost in this moment - 03:32 Min. 14 Whitney Duncan Skinny dippin' - 03:31 Min. 15 Brandt, Paul My heart has a history - 03:21 Min. 16 Dunn, Holly Daddy's hands - 03:28 Min. 17 Scott, Ray My kind of music - 03:00 Min. 18 Parsons, Gene Drunkard's dream - 02:37 Min. 19 Montgomery, John Michael Life's a dance - 03:08 Min. 20 Weissberg, Eric / Mandell, Steve Dueling Banjos - 03:16 Min. 1 Travis, Randy Forever and ever, Amen - 03:32 Min. 2 Newton-John, Olivia Please Mr Please - 03:22 Min. 3 Lang, K.D. Constant craving - 04:35 Min. 4 Ronstadt, Linda Blue Bayou - 03:55 Min. 5 Janson, Chris Holdin' her - 04:04 Min. 6 Nitty Gritty Dirt Band Workin' man (Nowhere to go) - 03:51 Min. 7 Zac Brown Band My old man - 03:45 Min. 8 McCoy, Neal The shake - 03:33 Min. 9 Aubrie Sellers Sit here and cry - 02:43 Min. 10 Clark, Guy Rita Ballou - 03:11 Min. 11 Anderson, John Wild and blue - 02:43 Min. 12 Chad Brock Evangeline - 03:50 Min. 13 Gosdin, Vern The first time ever I saw your face - 04:56 Min. 14 Muldaur, Maria My Tennessee Mountain Home - 03:29 Min. 15 Carter, Carlene Do it in a heartbeat - 03:28 Min. 16 Murphey, Michael Martin Cowboy logic - 03:35 Min. 17 Little Texas God blessed Texas - 04:05 Min. 18 Simpson, Sturgill Brace for impace (Live a little) - 05:50 Min. 19 Earle, Steve Feel alright - 03:03 Min. 20 Byrds, The Cowgirl in the sand - 03:20 Min. 1 Welch, Gillian Look at Miss Ohio - 04:13 Min. 2 Harris, Emmylou Pancho & Lefty - 04:48 Min. 3 Campbell, Glenn Tennessee - 03:03 Min. 4 Steve, Seasick Walkin man - 02:42 Min. 5 Paxton, Tom The last thing on my mind - 03:05 Min. 6 Shelton, Blake Honey bee - 03:29 Min. 7 Frankie Ballard Helluva life - 03:51 Min. 8 Lawrence, Tracy Time marches on - 03:02 Min. 9 White, Tony Joe Polk salad Annie - 03:45 Min. 10 Peterson, Michael Drink, swear, steal & lie - 03:02 Min. 11 Rabbitt, Eddie Every witch way but loose - 02:51 Min. 12 Highway 101 Whiskey, if you were a Woman - 03:03 Min. 13 Claudia Church What's the matter with you Baby - 03:47 Min. 14 Souther, J.D. Border Town - 03:49 Min. 15 Blackfoot Drivin' fool - 04:45 Min. 16 Yoakam, Dwight Guitars, Cadillacs - 03:03 Min. 17 McCarters, The Timeless and true love - 02:38 Min. 18 Jana Kramer Why ya wanna - 03:41 Min. 19 Montgomery, John Michael Sold (The Grundy County Auction Incident) - 02:30 Min. 20 Nelson, Willie Whiskey River - 04:02 Min. 1 Everly Brothers, The I walk the line - 02:38 Min. 2 Kristoffersen, Kris The silver tongued devil and I - 03:35 Min. 3 Ronstadt, Linda Desperado - 03:30 Min. 4 Hayes, Hunter Wanted - 03:48 Min. 5 Jewel You were meant for me - 04:12 Min. 6 Brett Eldredge Don't ya - 03:00 Min. 7 Prine, John Angel from Montgomery - 03:41 Min. 8 Clark, Gene No other - 05:08 Min. 9 Nielsen Chapman, Beth Sand and water - 04:06 Min. 10 Forester Sisters, The (I'd choose) You again - 03:18 Min. 11 Crowell, Rodney Shame on the moon - 04:36 Min. 12 Dunn, Holly You really had me going - 02:48 Min. 13 Sheppard, T. G. I loved 'em every one - 03:36 Min. 14 Roth, David Lee Cheatin' Heart Cafe - 04:05 Min. 15 Trick Pony Love be still - 04:12 Min. 16 South 65 Like an angel - 03:33 Min. 17 Mason, Mila That's enough of that - 02:45 Min. 18 Tritt, Travis Here's A Quarter (Call Someone Who Cares) - 02:31 Min. 19 Cochran, Anita Daddy can you see me - 04:36 Min. 20 Georgia Satellites, The Keep your hands to yourself - 03:23 Min.